It was inevitable that parallels would be drawn. Could Glasgow possibly deliver Games as special as London? Glasgow put on an opening ceremony that was unapologetically Scottish, with kilts, Scottie dogs and dancing tea cakes. The 2014 Commonwealth Games, Glasgow was the largest multi-sport event ever held in Scotland. The Games received acclaim for their organisation and attendance and hailed as ‘the stand-out Games in the history of the movement’. The hosts finished fourth with a best-ever tally of 53 medals. Having acquired a license to supply official Games merchandise we met with the organisers, brand managers and agencies to assess the scope of our creative contribution. From an early stage we saw the potential for a flagship collection of souvenirs centred on the Queen’s Baton Relay. These would be objects with iconic status, drawing from cultural and historic influences of the city of Glasgow and the Commonwealth Games movement. As with London 2012, we created a range of unique gift ideas with which to target key sponsor activation programmes. We created concepts for pre-Games marketing such as invitations and milestone celebrations, welcome packs and event kits for visitors during the Games and memorable VIP leaving souvenirs that would be cherished after the event. Working alongside the Queen’s Baton Relay team, we designed a unique souvenir baton along with a stunning Gemstone gift, both referencing the amazing Queen’s Baton that travelled throughout the country in the run up to the Games. These products featured laser engraved personalisation and were offered exclusively to the participants of the Queen’s Baton Relay as a lasting memento. The stunning Queen’s Baton containing the Queen’s message to the Commonwealth was carried by over 4000 baton bearers from Buckingham Palace in London to Hampden Park in Glasgow to herald the opening of the Games. Taking inspiration from the Queen’s Baton, we created the Commemorative Queen’s Baton. Those who took part in the relay had the opportunity to purchase a baton, each one personalised with their name, date of participation and a unique message of their choice. This very special anodised aluminium baton design featured a lattice work pattern inspired by the industrial and shipbuilding heritage of Glasgow produced using state of the art 3D laser cutting technology that really challenged the design engineers! 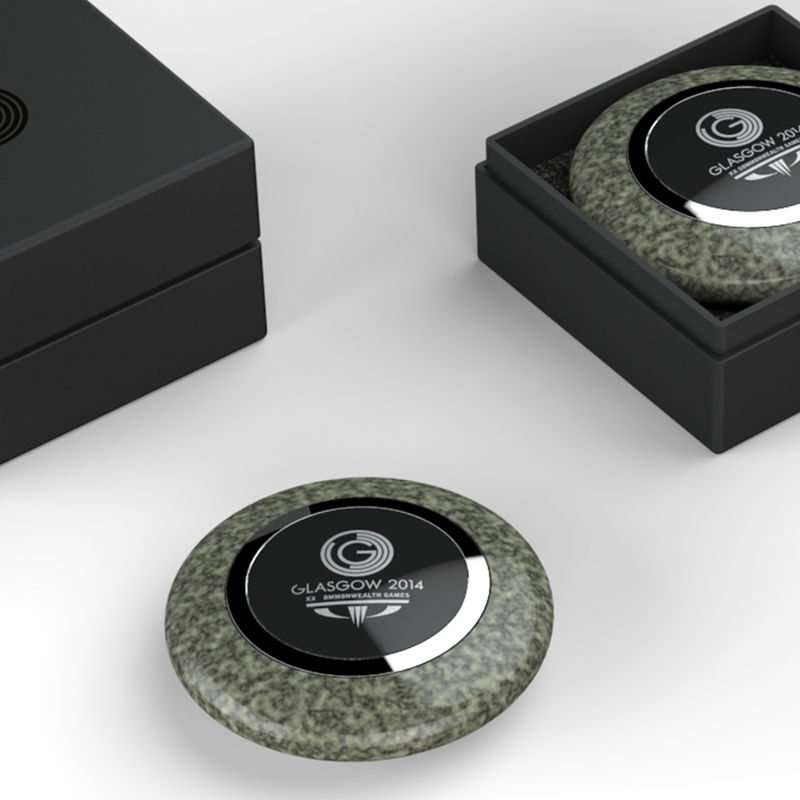 A granite ‘gemstone’ in the shape of a mini curling stone sat at the very top of the Queen’s Baton, sealing in the Queen’s message. It was carved from the unique water-proof granite found only on Ailsa Craig in the Firth of Clyde, Scotland. 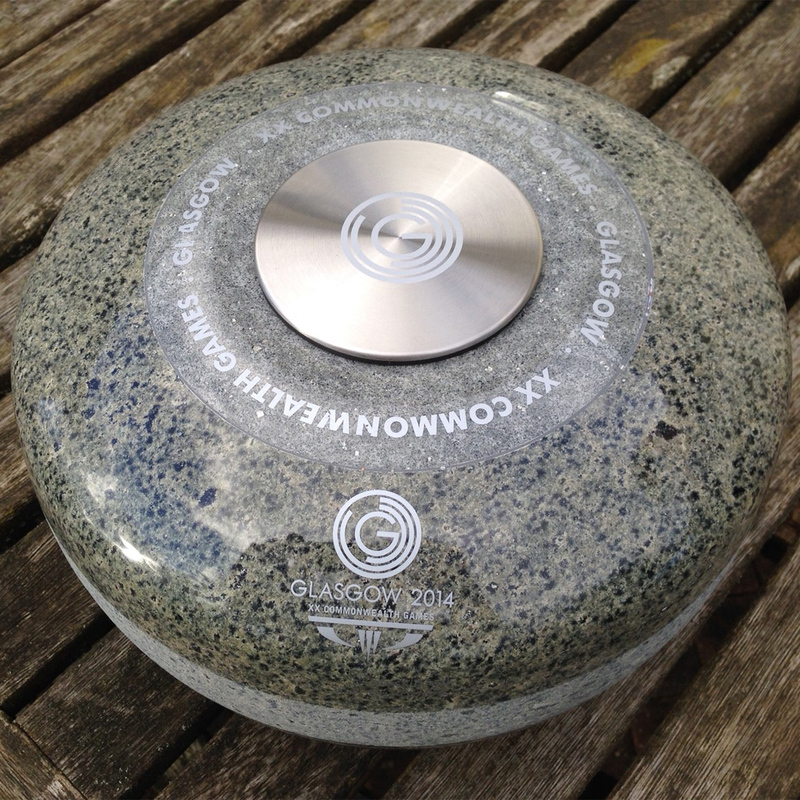 We created this replica ‘Gemstone’, crafted from Ailsa Craig Green Granite by Kays of Scotland, provider of the original stones. It is embellished top and bottom with a gold plated coin bearing the Glasgow 2014 logo one side with the Queen’s Baton Relay mark on the reverse. 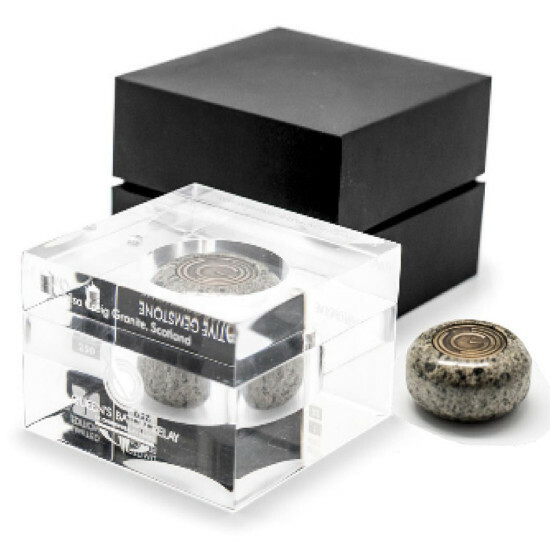 Each stone is one of a limited edition of just 250, encapsulated in a stunning machined acrylic presentation block. Curling is a sport synonymous with Scotland and winter sports. At an early stage of our license agreement we secured the rights to supply commemorative curling stones. These stones are the real thing, quarried from unique Ailsa Craig Green Granite by Kays of Scotland, suppliers of curling stones to successive Olympic and Commonwealth Games. The stones weigh a hefty 20kg, hand polished except for a rubbing strip at the waistline. We introduced a stainless steel disc at the top which could be laser engraved for personalisation and branding purposes. There is a very real need for more creative alternatives to the traditional VIP pass for large prestigious events. Typically it is a dull looking plastic pouch hanging on a standard lanyard. We believe the pass should be a quality object that enhances the visitor experience and is a souvenir that any guest, including discerning company executives, would want to keep. 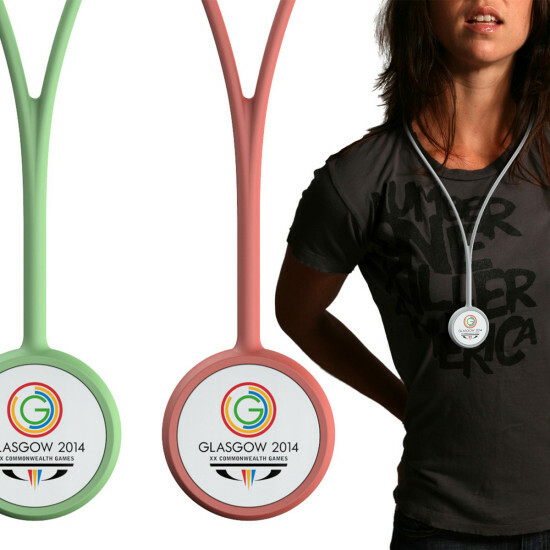 This elegant and cost effective VIP guest pass is in the form of a medal and features a disc bearing the sponsor logo on the front and Glasgow 2014 logo on the rear. The disc was designed to be interchangeable with plastic and more premium versions in metal with a gold or silver plated finish. The necklace was moulded silicone rubber available in a range of colours to suit the sponsors. 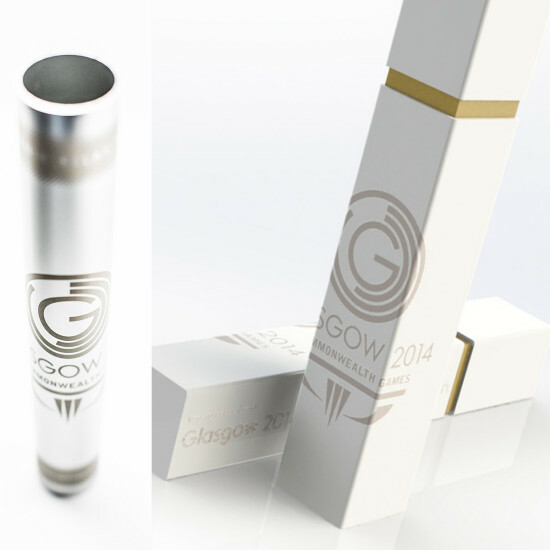 We were asked by the organising committee if we would design and supply the official Glasgow 2014 baton. The design changed many times during the development process with the final version featuring the large ‘G’ of the Glasgow Games. A certificate bearing a special message from the organisers was rolled up and inserted into the baton. 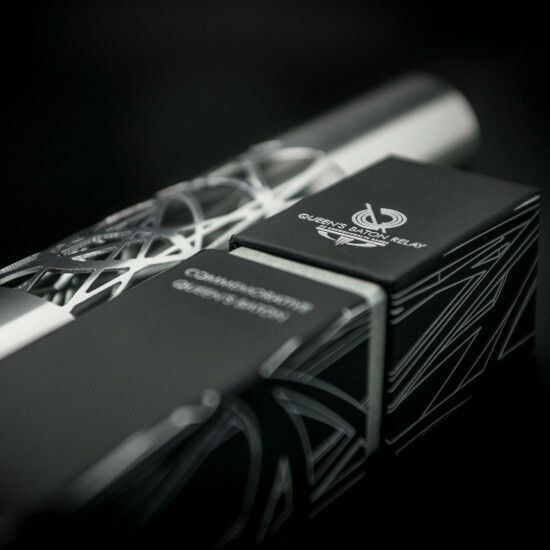 The silver anodised baton and silver printed wrap around graphic formed an elegant yet bold statement. In all, 5000 batons were delivered to Glasgow for gifting to visiting dignitaries. The Ailsa Craig green granite used for curling stones is a beautiful natural material with a lovely flecked patina. This product concept was developed for sponsors looking for a premium gift for their clients to take away from the Games. The polished stone is very heavy with an enduring quality, inset with a badge that could be branded for individual sponsors. 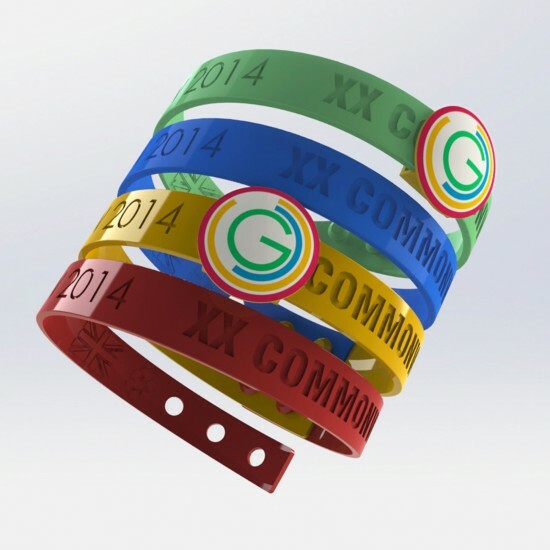 Wristbands are a popular, low cost volume gift for any global sporting event. This one is special because of its unique ‘daisy chain’ design developed by us. Unlike most wristbands it is not a closed loop but a flat rubber strap that allowed additional coloured bands to snap on and it to form a multi coloured, twisted loop. Most importantly, the wristband is made in the UK from recyclable EVA rubber (not silicone) to comply with the green credentials of modern global events. And because it is an open loop, a moulded or die cast charm can be slid onto the wristband to offer unique personalisation opportunities.